A Scottish Cup medal won by legendary Celtic centre-half, Willie Cringan, in 1923 is set to take centre stage at McTear's. The historical piece, which McTear’s estimate could fetch £2,000, was presented to the player following Celtic’s 1–0 victory over Hibernian in the final at Hampden Park on 31 March 1923. Over the years the medal has passed through the Cringan family and is now owned by the player’s grandson, also named William Cringan. William said: “My grandfather was a great footballer and a great man too. I was only five when he passed away but I do remember sitting on his knee and listening to his stories. In later years my dad told me that after my grandfather retired he would hold court in his pub in Bathgate telling story after story to his customers. He was the kindest person you could meet and over a period of time he gave away lots of his memorabilia to Celtic fans he met. Willie Cringan (1890 – 1958) was a Scottish international footballer who played for Sunderland, Ayr United, Celtic, Third Lanark and Motherwell. The player's senior debut for Celtic came in a 2–0 victory over Rangers on 12 May 1917. He would later go on to captain the team until his departure in 1923. 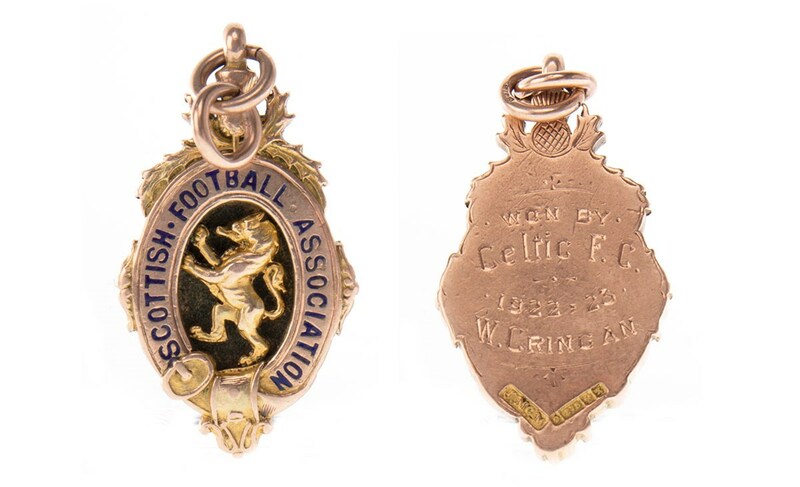 Commenting on the auction, James Bruce from McTear’s said: “We have had a number of very early Old Firm medals come to auction over the past few months and indeed we recently saw Willie Cringan’s league- winning medal from 1919 go under the hammer. The fifteen-carat gold Scottish Cup winner’s medal, along with photographs of Willie Cringan and a menu from the official dinner after the 1923 Scottish Cup final, will feature in McTear’s Works of Art Auction on Friday 23 November.